Creating a backlog helps you define the work that needs to be done. Once you have a backlog, you can use it to help manage when that work gets done, as well as associate items on the backlog with check-ins, acceptance tests, or other criteria. If your team doesn’t have one, set up your team project now. If you do have a team project, but you don’t have access to it, get invited to the team. 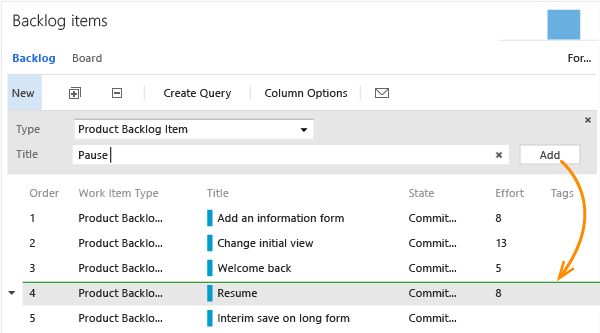 Open the backlog page from Team Web Access or Team Explorer. For example, the Fabrikam, Inc. team navigates to http://fabrikamprime:8080/tfs/DefaultCollection/Fabrikam%20Fiber%20Website/_backlogs. 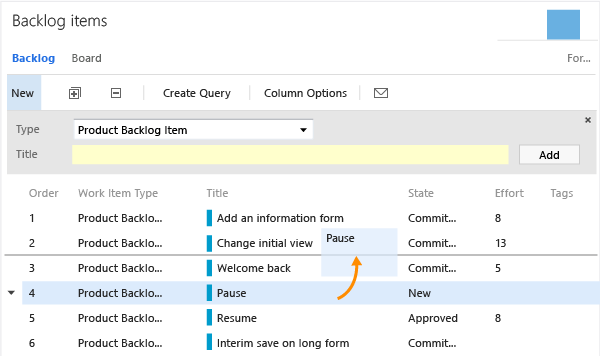 Create a backlog item. Enter a title and add the item. Different backlog item types appear with different colors, to help you distinguish them at a glance. For example, bugs show as a different color than backlog items. Highlight an item in the list, and then add another item. It will be added where focus is in the backlog, which is indicated by a line. You can move the focus in the backlog with the up and down arrows on the keyboard, or with a pointing tool. To change the order in which items are listed, you can drag them up or down within the list. To move an item in the list using the keyboard, hold down the Alt key and use the up and down arrows. You can also move an item to the top of the list or specify a value to reorder within the list. Q: Can I create a hierarchy of backlog items in just one backlog? A: If you want a backlog hierarchy, you should consider working with a portfolio backlog. Q: Is there a way to bulk add items to the backlog? A: Yes. You can use Microsoft Excel or Microsoft Project to quickly create and update multiple work items. Q: Is there a way to filter the backlog list? A: Yes, you can add tags to work items and filter the list using tags. Q: How do I map my backlog items to Features? 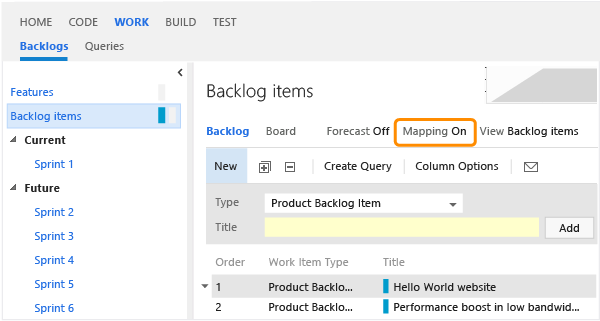 To add a backlog item, drop it onto a Feature in the mapping pane. To learn more, see Work with portfolio backlogs. Q: I created a backlog item, but it isn't showing up on my backlog. Why? 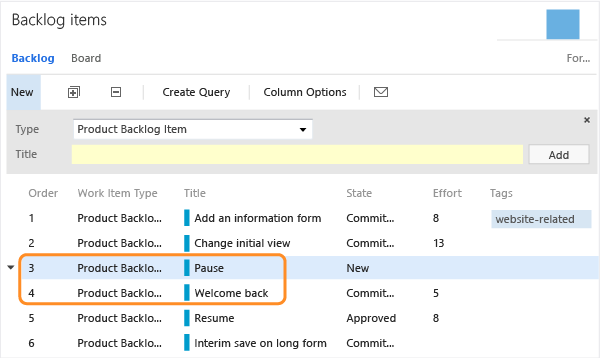 Q: Can I change the query used to populate a backlog? Can I track bugs on the backlog? A: You can’t change the query used to populate the backlog. However, you can change the types of work items that appear on the backlog. Q: Can I delete items from the backlog? A: No, but when you set the item’s State to Removed, Closed, or Done, it no longer appears on the backlog. Also, you can change the item’s Area Path to remove it from your team’s backlog. Q: How do I create and track estimates of the work required for my backlog items? A: Depending on the work item type that appears on your backlog, you can open an item and provide an estimate of the Effort, Story Points, or Size required to complete it. For recommended best practices, see Estimating. Q: What options are available to customize the backlog? A: To learn more about customizing your experience, see Configure and customize Agile planning tools for a team project. Q: Why do my work items and backlogs have different names than those shown here? A: Objects used to track work vary based on the process template used to create your team project. If you use Visual Studio Scrum, you can create Product Backlog Items and Bugs with estimates in the Effort field. MSF for Agile Software Development supports creating User Stories with Story Points for the estimate. And, MSF for CMMI Process Improvement supports Requirements with Size for the estimate. All three templates support tracking Features on the portfolio backlog. 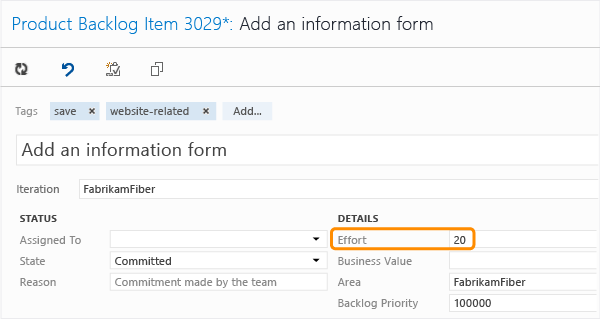 To learn more about the three process templates, see Work with team project artifacts, choose a process template. Q: How do the three types of backlogs differ? A: Each of the backlogs serves similar but distinct purposes. The product backlog and portfolio backlogs contain high-level views of the stories, deliverables, features, or experiences that product owners want to track for the duration of a product release. Your product owner ranks the backlog items or deliverables in these backlog views and provides sufficient detail during the planning meeting so that your team can estimate and implement product backlog items. In contrast, your team creates the sprint backlog, which contains the tasks to complete to finish backlog items committed for the sprint. In the product backlog, your team estimates the Effort, Size, or Story Points of backlog items. In the sprint backlog, your team estimates tasks, usually in hours or days. You do not need to create a sprint backlog in order to use the product and portfolio backlogs, but you will need to create a product backlog in order to create sprint backlogs. Your product owner might update the product backlog every week, while your team might update the sprint backlog daily. Your product owner maintains the same product backlog throughout the project, but your team creates a new sprint backlog for each sprint. The following table provides a comparison of each backlog's features.